Judging by the interest of its visitors – which was huge, the exhibition “Skilauf! Ästhetik, Technik, Mode” shown by the Skiclub Arlberg in the summer of 2005 set the initial spark to establish the “ski.kultur.arlberg” association. The idea was subsequently realized at the Hotel Schmelzhof. The aim was, and still is to research the history of ski sports on the Arlberg more extensively. In 2008 the project “On the trail of a wonder in white” was started under the direction of Professor Bernhard Tschofen. Historical materials were gathered and analysed resulting in a scientific documentation of in excess of 1000 pages. The basis for a great new book that will be presented on the 8th December – back where it all started – at the Hotel Schmelzhof. 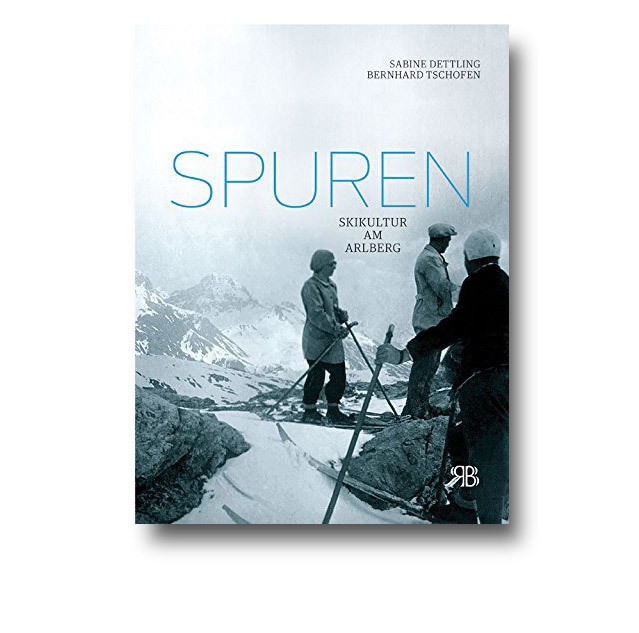 “Spuren – Skikultur am Arlberg” is published in hardback comprising of 364 pages and more than 700 images. It will be the first comprehensive work that examines the history of skiing on the Arlberg in greater detail . With many fascinating stories and spectacular never before seen historical photographs. The book “Spuren – Skikultur an Arlberg” is available to browse in the library of the new chatting room for all our guests in the Schmelzhof. All guests who book one of our Wellness packages will receive a copy of the book as a gift. “Spuren – Skikultur am Arlberg” invites its readers on a journey through the history of ski sport and winter tourism. The elaborately designed volume leads you through eras which show the creation of the skiing mountains around the Valluga, the queen of the Arlberg. Also highlighting the routes up the mountain peaks on skis and via cable cars, and the development of equipment and skiing techniques by ski instructors and club members . Containing texts and images which clearly illustrate how skiing became a much admired lifestyle and would soon inspire the masses after featuring on film, and laying the foundations to changing the myth to the reality of a ski paradise on the Arlberg. Both world wars are also thematised as these two new novel wooden planks played a significant role during war times, which also had a major influence on the further development of ski sport and tourism. Distinguished individuals of ski culture in its various different eras will be here to tell their stories, giving an insight into the spirit of the times. Hermann Hartmann, Paul Martin, Josef Ostler, Viktor Sohm, Julius Rhomberg, Hannes Schneider, Rudolf Gomperz and many more will divulge their experiences of their first time on ski´s, from first ascents of the now famous skiing peaks and slopes, to the origins of the Arlberg technique and the continuous tinkering with their ski´s and bindings. Nostalgic pictures show snow skiing on the Arlberg around the 1900´s, with spectacular photographs showing the allure of the “two planks” in sport and holidaying in a fascinating manner. The book by Sabine Dettling and Bernhard Tschofen documents the project “On the trail of a wonder in white” from the ski.kultur.arlberg society whose aim it is to raise awareness in the region of the Arlberg and its guests about how the Arlberg is the cradle of alpine skiing. The fascination of skiing has continued uninterrupted until today and has left a lasting impact on the Arl- and Tannberg. The publication is an invitation to follow this success story with the help of texts and images and historical documents.